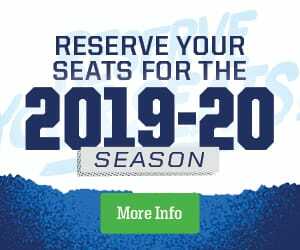 Extensive travel is a fact of life for the Manitoba Moose. While many Central Division teams are a basic bus ride apart, the Moose have to board a plane to get anywhere. That travel can lead to scheduling quirks like this week where the team played Friday in Milwaukee and Saturday in Chicago, but isn’t scheduled again until tomorrow here Grand Rapids, Mich.
With the frequency of games to come and the intensity increasing as the season moves towards the playoffs, a few days on the road to recharge isn’t a bad thing, but making the most of them is the key. To that end, Moose forward Seth Griffith and his teammates enjoyed a fun-focused skate yesterday to break up the grind. True to his word, Griffith and the Moose ramped things up in practice today in West Michigan. 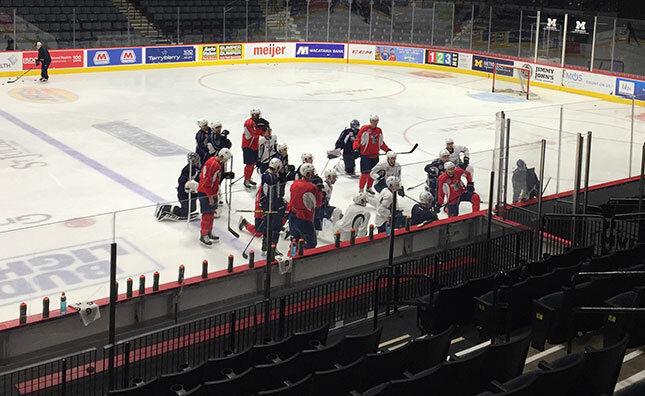 The club addressed the details of special teams and even-strength team play in the brisk, fast-paced session ahead of Wednesday’s clash at Van Andel Arena. Griffith takes an 11 game point streak, comprised of a goal and 14 assists, into tomorrow’s game against Grand Rapids… a team the Moose have beaten once in six tries this season. Despite Manitoba’s difficulties versus Grand Rapids this season, the team has recent positives to build on. Those include a point gained from a very competitive 2-1 overtime loss at Van Andel Arena Jan. 23. With just four regulation time losses in 16 games since the holiday break, the Moose believe they’re capable of consistently earning points and they know what it takes to do so. The Moose have a win and a loss coming out of the all-star break, and a point or better in three out of five on their current swing. Wednesday’s clash in Grand Rapids gives the Moose a chance to finish a critical stretch with an solid haul before returning to Bell MTS Place for six outings in front of the home fans. You can listen to the Moose and Griffins starting at 5:45p.m. CT Wednesday on TSN 1290, moosehockey.com, the Moose App, or stream live on AHL TV.